It has a few issues. First, it tries to install all patches. Like the latest version of Internet Explorer, major service packs, and that ridiculous Windows Search 4.0. These require user intervention, and might even break things. Another issue with the script is that it does not let you know when it failed because the network is down. We took that script changed it to only include security updates. 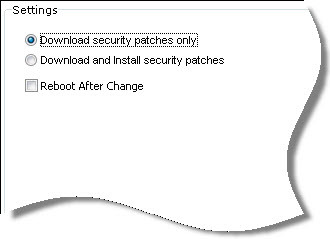 That way it gets to the core of the issue – getting the latest security patches, without any extra stuff. The script, and the plugin work with Windows XP, 2003, Windows Vista, Windows 7, and Windows 2008. 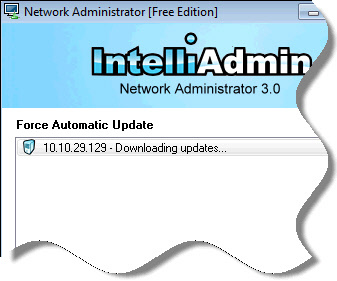 It does require administrator access, so if your users have a limited account you will need to either use the task scheduler, group policy, or Network Administrator. One other thing to note, is that it does not install service packs – So keep that in mind when using the plugin, or the script. How in the *hell* did you find those methods in VB Script? I have the god awful script that launches IE, and has code to check for each different version of IE so it can do the proper clicks and stuff. I purchased Network Administrator a while back. How do I install this latest plugin? It will automatically install the new plugins. This is true for the free, and paid versions. Downloaded the free trial and tried to patch an xp machine with sp3. If manually checked on pc, there are 118 patches available, when I try with NetAdmin is says the pc is up to date. 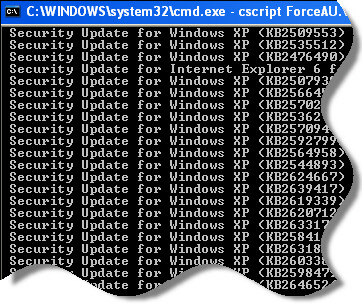 Was looking to push down the latest critical MS patch as at 21/09/2012. Is it possible you picked the option “Download Only”? Looks like we found the issue with updates not showing. We were not clear in the plugin that it was only downloading critical updates. We have updated the plugin to allow non-critical updates…and it also now has the ability to just show what updates are needed, and take no action. This is exactly what I was looking for. Thanks! Using just the script, is there a way to add an automatic reboot command (if required) right in the script itself? It could be because you have a Windows Update Server setup and the machine cannot contact it. Is that a possibility?